Mia, that lovely, funny, whacky hopped-up magpie over at Pepperbox Couture has nominated my blog for the One Lovely Blog award. How cool is that! Thank you, I love your blogs, too, and I love the philosophy behind your creations. I hope you go from strength to strength. 1. I avoid eating eggs because I hate those icky bits in the white, although I am able to put this out of my mind when I am offered cake. 2. I spent over two years in psychotherapy in my late 20s, and often feel that I should ask for my money back. 3. I have an unshakable conviction that I will win the lottery one day. 4. I am not a duvet person – I like sheets and blankets. A lot of people think this is stupid. I think they are stupid. 5. I do not like dogs. I was bitten by my uncle’s Alsatian when I was 14 and still have a scar on my shoulder to prove it. It could be due to that. 6. I am a Libran but I do not believe in astrology. The fact that I am unbalanced, shallow and frivolous is pure coincidence. 7. I had a breast reduction when I was 44. It was one of the best things I ever did. And the most painful. Next – nominations for blogs that I follow, appreciating the effort that is put into them, not to mention the humour and wonderful ideas. I follow other, well-established blogs as well, and the Tamaras and Trishes and Janettes and Lisas and Laras all deserve my thanks for their support and helpful comments and creative ideas. This entry was posted in blogging, Craft, inspiration, One Lovely Blog award and tagged craft, creativity, crochet on July 27, 2012 by Nice Piece of Work. 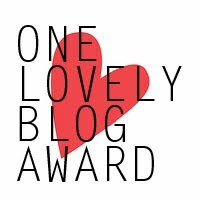 Congratulations on winning the One Lovely Blog award and I loved hearing the 7 different things about you. I did used to be a duvet person, but when I got married my husband couldn’t stand them and I was obliged to rethink (and not just about duvets!). Now I love the weight of my blankets, and have a variety – white cotton, handmade pastels, animal-patterned acrylics, etc. No theme, me. You really are a nice piece of work chick! Congrats :) Ditto on the lottery and duvets for me too! Congratulations on your award Jill, & thanks for nominating my blog! I really appreciate all the lovely comments you leave me, they’re so up-lifting! You mean, you weren’t ALREADY following me??? Uplifting is good. I take it that wasn’t also a reference to my breast reduction? Now you get to “accept” the award and add the image as a widget and tell us 7 things about yourself and nominate other blogs that you think are deserving. Heh. More work….